Jordan’s peace treaty with Israel was unique as it bore the promise of what was termed a "warm" peace between the two warring countries. With legitimacy provided by Madrid and Oslo, hopes for "true" peace, as the Israelis would describe it, were high. 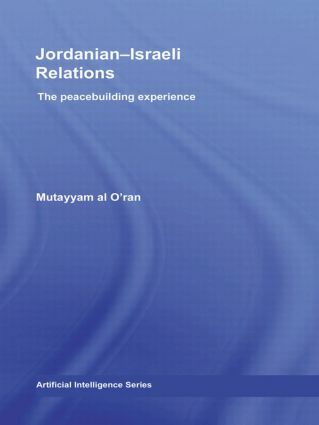 This book explores the Jordanian-Israeli relations from a Jordanian perspective, focusing on the peacebuilding experience since 1994. In examining the reasons why a warm peace has not developed, the book focuses on the interplay between agency and structure on the Jordanian side, in relation to the Israeli-Palestinian context. In doing so, the book discusses the role of the various Jordanian leadership layers in the process and brings to the light intra-societal dynamics and particularities of the Jordanian social construct. With research based on the premise that international relations are social constructions, meaning that facts are theory-laden and contexts matter to political actors since they influence their understanding of conflict and impact upon their decisions, the book also serves as an example of the application of an inter-disciplinary approach to analyzing conflicts and subsequent peacebuilding experiences. This book will be of interests to students of Politics and International Relations, History, Middle Eastern Studies and Social Studies, in particular those interested in the areas of Conflict Resolution and Peacebuilding.